The lighting and stage design for BRIT Award-winning band Rudimental’s recent tour may have been deliberately ‘old school’, but there was nothing old-fashioned about the technology used to create it. Award-winning LD, Jonny Gaskell of Brighton, UK-based Pinnacle Event Productions used R32, the latest version of CAST Software’s wysiwyg previsualization software suite, to give his creativity maximum bandwidth and ensure that what was programmed in theory was deliverable in reality. 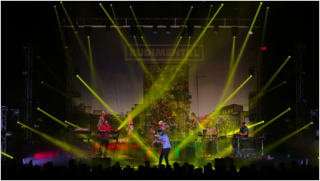 Rudimental for Pinnacle Event ProductionsRudimental’s multi-performer approach to their live show meant the band felt there was no need for video in their set design. Instead, they gave Gaskell a brief to create a set reminiscent of an old-school rock festival, with the Hackney Peace Carnivalmural as a backdrop that could be lit from behind or in front.